In September of 1990, Vader was one angry monster. On August 10th, 1989 he had won the IWGP Heavyweight Championship from Riki Choshu, and he held the title for over a year. On August 19th, 1990, after four successful defenses, he defended his title against the man he had taken it from. On this day things were different, and for the first time Riki Choshu defeated Vader and won back the IWGP Heavyweight Championship. Obviously livid, the next match that Vader had in New Japan was less then a month later against young Masahiro Chono. Masahiro Chono during this time period was finally enjoying success in the heavyweight division. With Mutoh, Chono had won the IWGP Heavyweight Tag Team Championship in April of 1990. It was Chono's first title in New Japan and he was finally gaining ground in the promotion. On the same event that saw Vader lose to Choshu, Chono teamed with Mutoh to successfully defend their titles against Mike Enos and Wayne Bloom. But even though he was rising in the ranks, Chono had never defeated New Japan's most hated gaijin, the man who had pinned Antonio Inoki in under five minutes. With Choshu in his corner, Chono was set to prove that he was ready to be the top wrestler in the promotion, while Vader was out to show that he was still the dominate force in New Japan as he looked to not lose two consecutive matches. The stage is set. Masahiro Chono comes down to the ring first, with Riki Choshu already at ringside as he had wrestled in the previous match that night against Masanobu Kurisu. Choshu gives Chono a pep talk on the apron as Vader's music starts. Wearing the head gear along with the full mask, Vader puts the mask down in the middle of the ring and poses to the crowd. 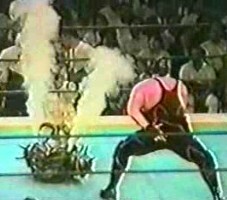 As the announcer introduces the wrestlers, when Vader is announced the mask shoots out smoke. Chono is still the more popular one in this match however as the crowd throws streamers and cheers as Chono is introduced. The referee checks the wrestlers and then calls for the ring of the bell. 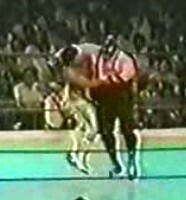 They circle each other to start, tie-up, Vader pushes Chono back into the corner and clubs him in the face before backing off. Chono falls to the mat from the blow, Vader picks him up, Irish whip, and he delivers a short-armed lariat. Back up, Irish whip by Vader and this time he hits a regular lariat. Powerslam by Vader and he hits a running splash, cover, but Chono barely gets a shoulder up as the crowd stomps its approval and begins chanting his name. 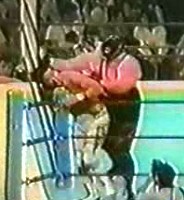 Vader pushes Chono into the corner and punches him repeatedly in the face and back of the head. Chono tries to fight back but Vader stops his attempt with a headbutt. Irish whip by Vader and he nails a Vader Attack in the other corner. Chono rolls out of the ring as Vader poses in it, but Vader then goes out after Chono and drops him onto the guard rail. 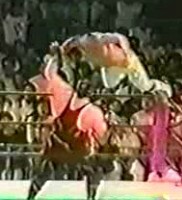 Vader pushes Chono back into the crowd and punches him near the bleachers. Vader continues beating on Chono up into the crowd, delivering Vader Hammers left and right. After he is done pummeling Chono, Vader returns to the ring and waits for his opponent to find his way back. He does after a moment, but Vader punches him as he goes through the ropes and clubs him repeatedly in the corner. Vader picks up Chono and hits a falling powerslam, cover, but Chono kicks out at two. Vader drags Chono to his feet and punches him in the corner until Chono falls to the mat. In the end, Chono was scrappy but was simply not able to take the big man down. If he had been able to apply the STF in the middle of the ring, perhaps things would have been different, but he was so weakened by all the brutal Vader Hammers throughout the match that Chono was only one big move away from being put down. And that is what happened, as he went for one too many diving shoulder blocks and got caught. Vader would go on to regain the title in January of 1991, proving that his loss to Choshu was just a fluke and that he was still the man to beat in the promotion. Chono and Mutoh would lose the titles in November, but Chono would have his greatest accomplishment to date in August of 1991 when he won the first ever G1 Climax. Vader was the better man on this night, but Chono showed he had the skills to hang with the gaijin monster and he'd use the loss as a learning experience for the challenges ahead.